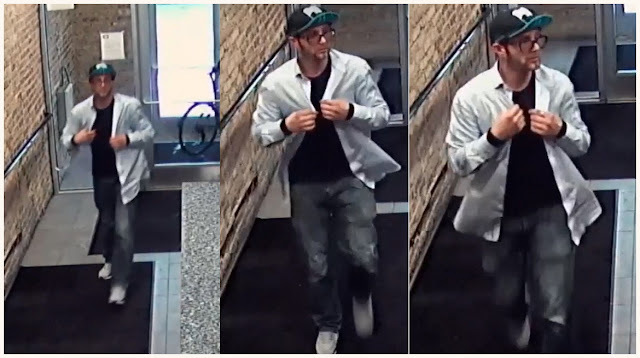 Surveillance cameras captured images of a package thief carrying armloads of boxes out of a Lakeview apartment building. Now, cops have released video of the theft in an effort to track the criminal down. In the recently-released video, the man seen here walks into a residential building on the afternoon of January 15th, slipping in as a bike messenger walks out. He walks past an unattended doorman station and heads straight for the mail room. There, he loads up a giant sack with boxes. Next, he tugs on the mailboxes to see if they'll open. And, finally, he walks out again with two arms full of parcels. He’s carrying so many boxes, one falls to the ground as he tries to push the front door open. Oh, don’t worry. He took the time to pick the downed package back up, re-balance it, and carried it out. Police did not indicate why the video was released six months after the theft occurred.